You are browsing the archive for HMFT. In my last post I talked about detecting Extended Attributes (used by ZeroAccess malware) using HMFT. Today I got a chance to update it a bit with some more information. You can find a full list of samples using EAs together with hashes (md5_sha1) here. You can download latest hmft here. The topic of Extended Attributes (EA) has been recently covered in an excellent post by Corey. 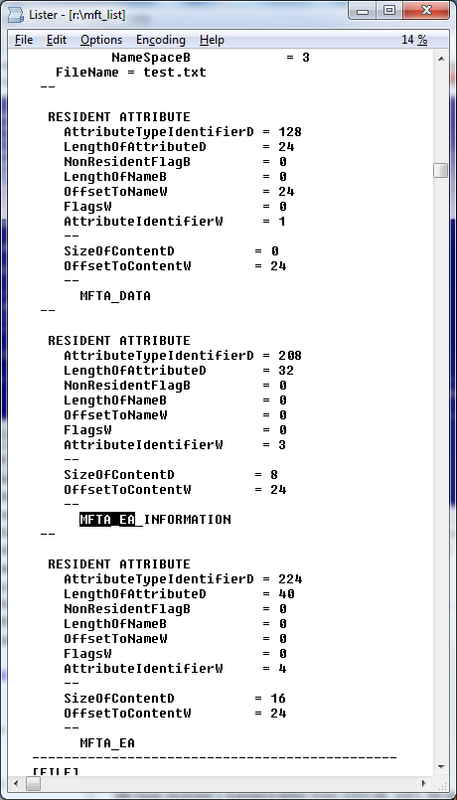 Entitled Extracting ZeroAccess from NTFS Extended Attributes it goes into (amazing) depth explaining on what EA is and how to extract this artifact from the system. It’s a pure forensic gold and if you haven’t read this post yet, please go ahead and do so before reading mine. Similarly to Corey, I was very interested in researching EA, and I finally took some time tonight to have a deeper look at it myself. I actually wanted to dig in the code more than the $MFT artifacts alone not only to have something to write about (after all, Corey already covered everything! :-)), but also because I wanted to see how the EA is actually created and what system functions/APIs are used by malware. The reason behind this curiosity was improvement of my analysis tools and techniques, and a few other ideas that I will be quiet about for the moment. To my surprise, none of the samples I checked used this function at all! 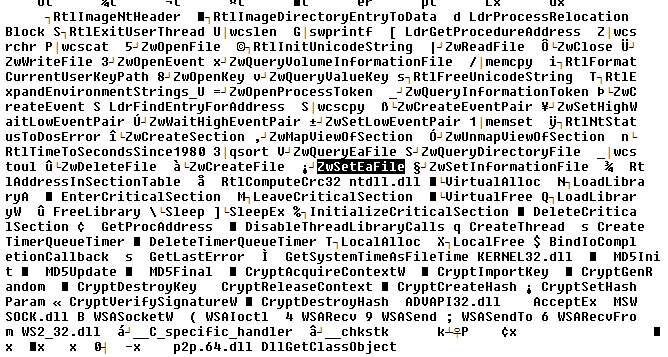 Curious, I started digging into it a bit more and realized that for the samples I looked at, the EAs are actually created not by ZwSetEaFile/NtSetEaFile function, but by ZwCreateFile/NtCreateFile. One thing to note – the EA is added to files on both windows XP and Windows 7, but only under Windows 7 I observed the modification of services.exe. On Windows XP, it only appended EA to the ‘U’ file and nothing else. Okay, I mentioned I had a couple of ideas why I wanted to research this feature. Now it’s time to reveal them! This code can be used for testing purposes in a lab environment. You can either compile the code yourself using masm32 or you can use a precompiled binary – download it here. Remember to specify a full path to a file. 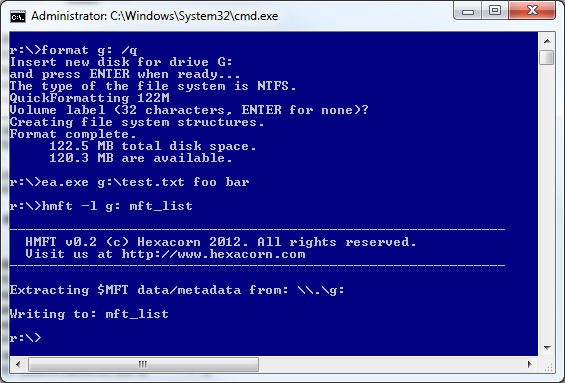 Also, choose a non-existing file name for a file (the program won’t work with files that are already present). While it is a novelty technique, it is not very advanced – a single API call does all the dirty job to _create_ the EA. 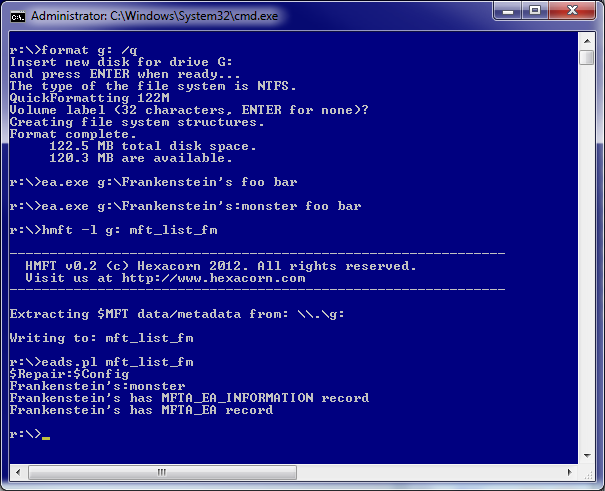 and then analyze changes introduced to the file system. I can do it quickly with hmft. 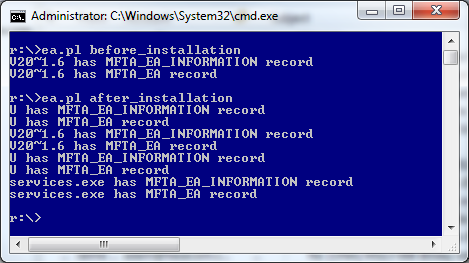 I then opened the mft_list file in a Total Commander’s Lister and searched for MFTA_EA. As we can see, the malware activity is immediately visible. 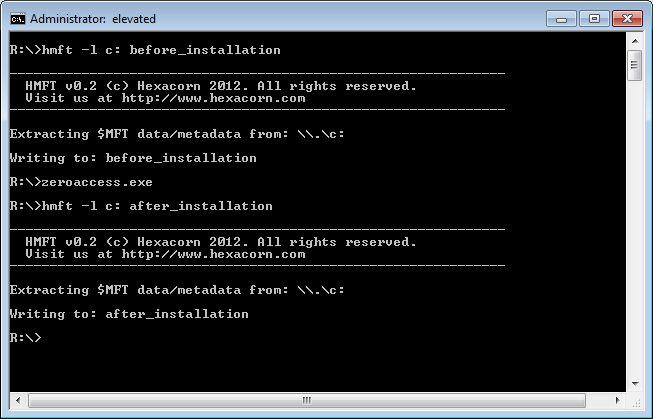 Using EA and ADS (Alternate Data Streams) with a single file is also possible. we can easily detect such beast as well.